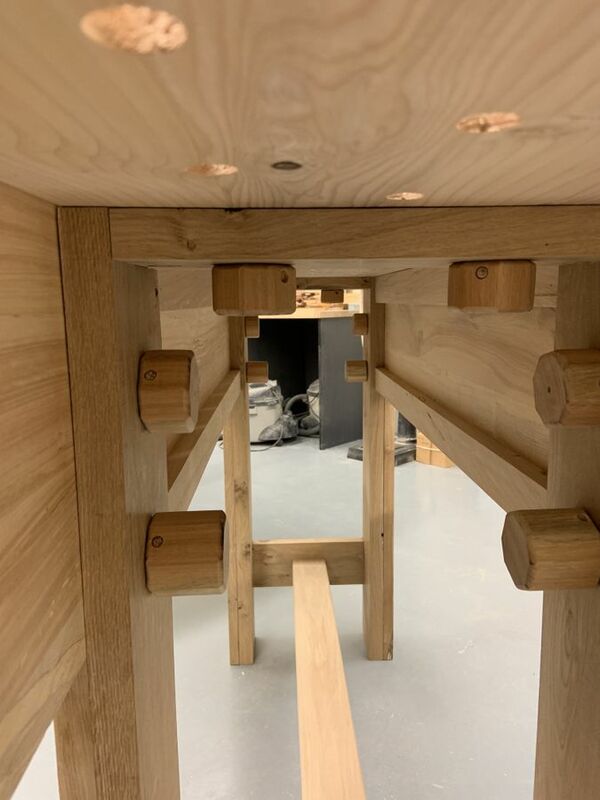 This is my interpretation of the Nicholson knockdown workbench. 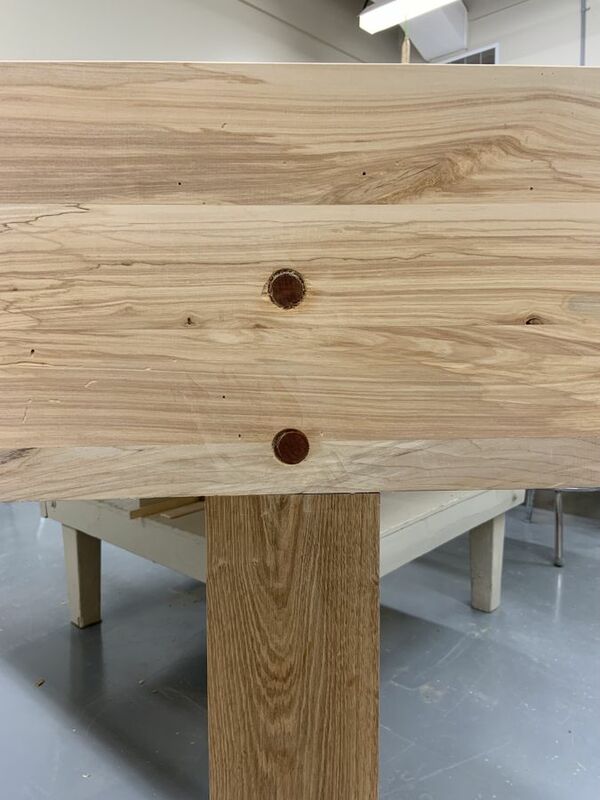 I largely followed the concepts from the Popular Woodworking article by Christopher Shwarz (issue 221, November 2015). That said, I did not follow the plans. I specifically wanted a knockdown structure that required no tools to put together, and being from Canada I wasn't sure where I could reasonably access the hardware he suggests. Cost-wise, I'm probably all-in at around $50 CAD on this build for materials, and maybe 40 hours of work. My apologies - I have no build photos, only the finished product. So the primary heros of my build are the screws I made to hold the whole thing together. I have a Beall wood threading kit I got off of Kijiji a few years ago (Canadian Craig's List). I've done a few projects with it - clamps, mainly; a moxon vice, etc. Over the summer I attended a local farm estate auction where the estate was auctioning of 20,000 board feet of lumber that the farmer had milled from his property during his lifetime. I was able to score 1400 board feet for a total of $310. 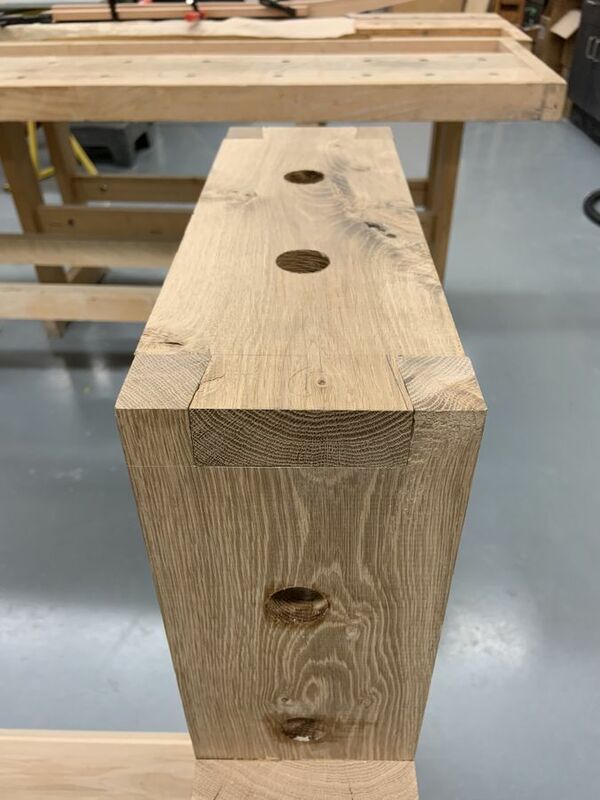 This included about 600 board feet of white oak (plain sawn); 600 board feet of poplar and birch (the majority of the birch is spalted); and 200 board feet of Ash. Having such inexpensive lumber around, I decided to go whole hog on this and try out a bunch of new techniques and practices in my build. To begin with, I prepped a bunch of cherry and oak stock down from 8/4 or 6/4 to 4/4 and cut 1x1 blanks with them. Afterwards I ripped those blanks into octagons on the table saw. This is all so that I could cut 1" dowels that I could later chase threads in. 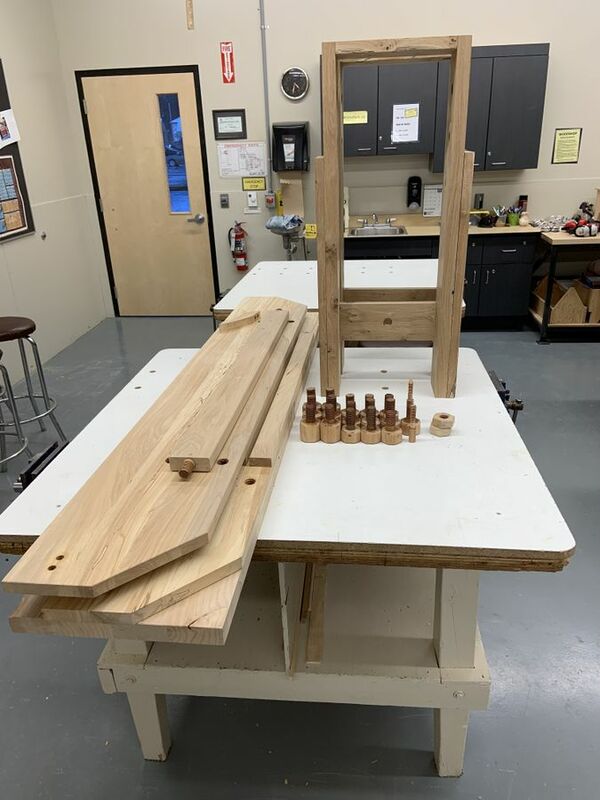 I followed a number of videos on youtube for making dowel makers. 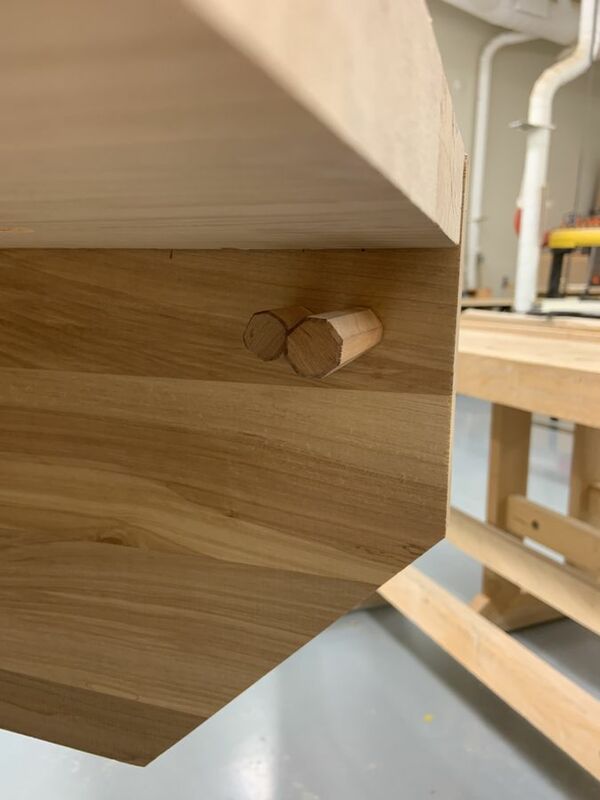 After a number of false starts, I was able to devise a successful one using a step drill to make the pilot hole; and an old plane blade became a permanent fixture to cut the dowels. 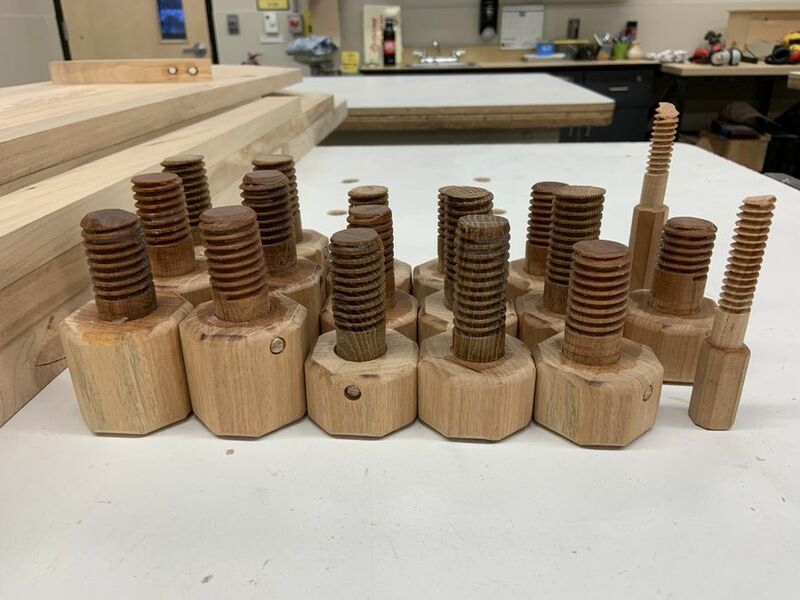 The dowels soaked for a week in mineral oil, and then I chased threads with the Beall threader. 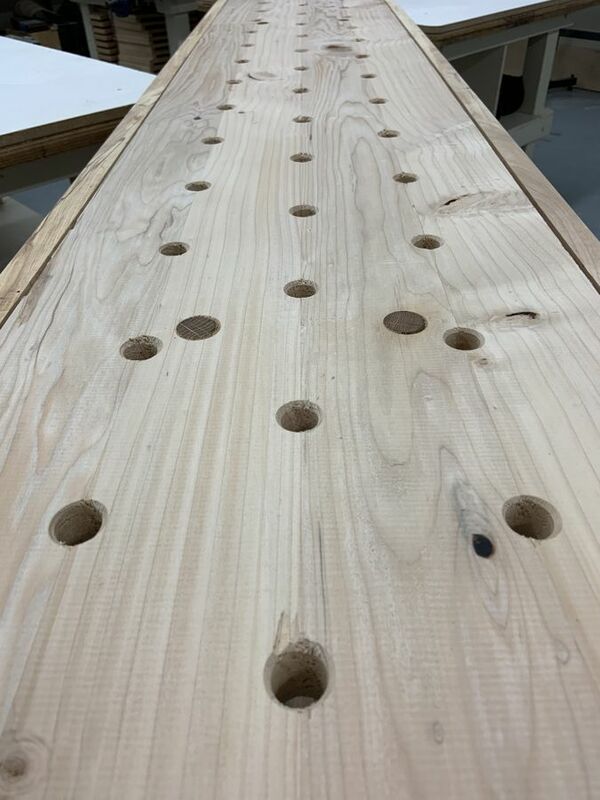 The size of my workbench was decided for me, as I had made a new workbench top for my existing setup (the "New Fangled" Workbench) months ago out of Douglas fir. I had not gotten around to using it yet, so I decided to use it as a starting point. As it was only 14" wide, it led to some modifications to the original design. 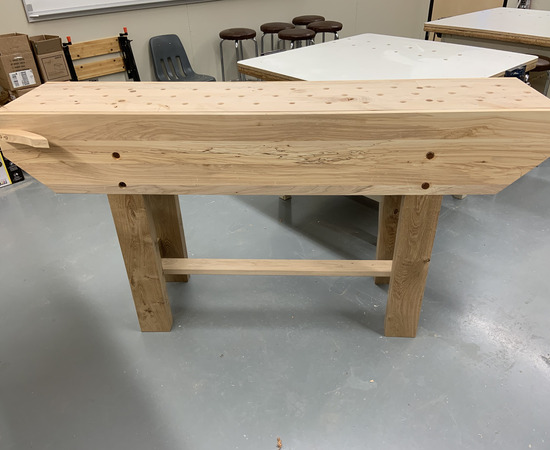 In order to maximize the workspace, I decided to let the workbench aprons extend to the height of the table top to add a couple inches to the depth of the bench. This necessitated ensuring that there are supports attached to the apron to support the top across the span between the legs. 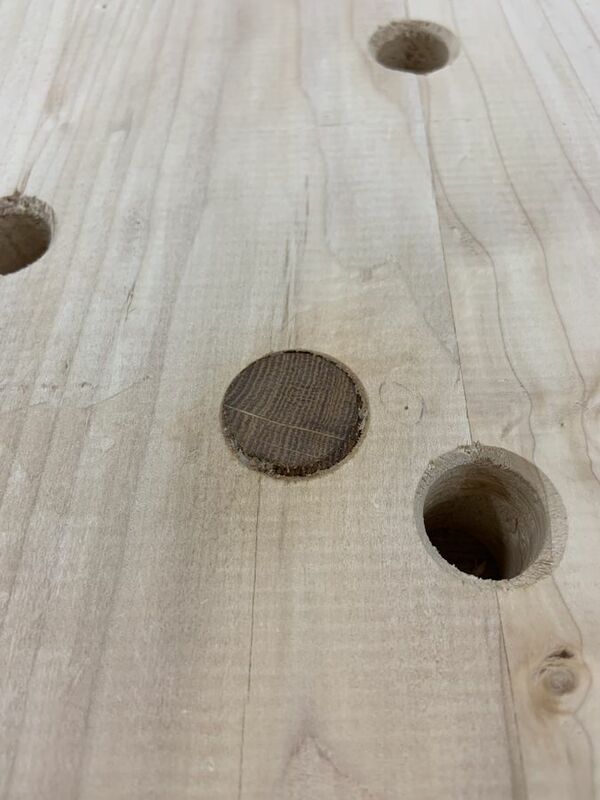 As most of the wood I had available was either 6/4 or 4/4, the thickness of most of the components is diminished from the PM plans. 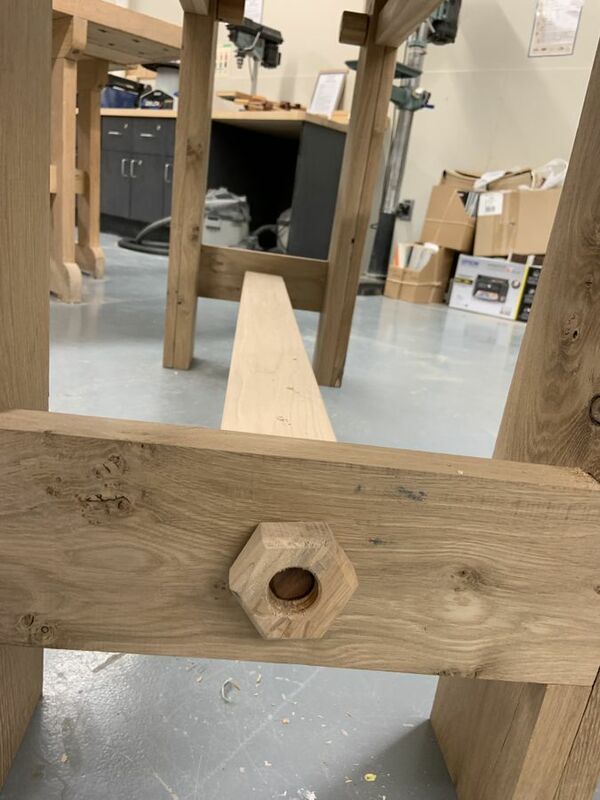 Given that weight is a factor in bench use, I opted to build the leg frames completely from white oak, which adds a substantial amount of weight to the structure. 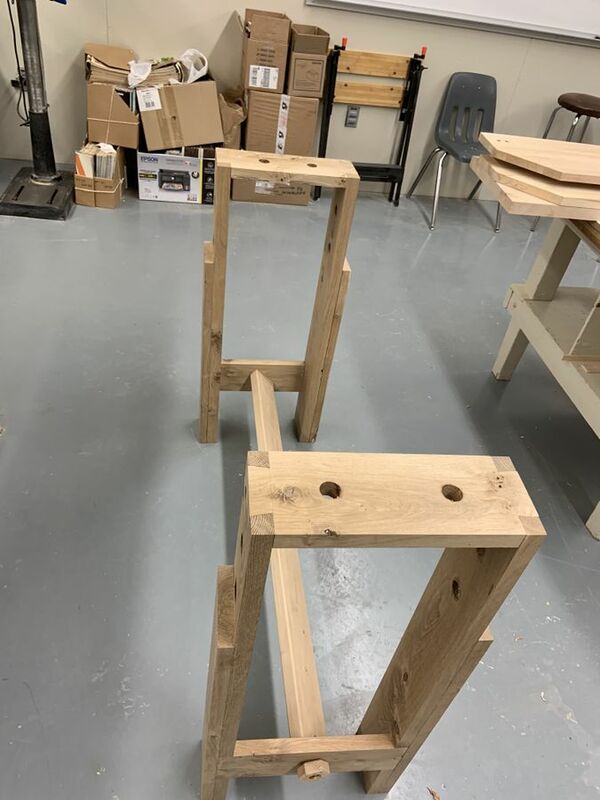 To manage racking and keep the bench solid, I opted to dovetail the upper rails of the leg frames, half-lapped the lower rails and added a stretcher across the bottom - which is also attached with wood screws and bolts. 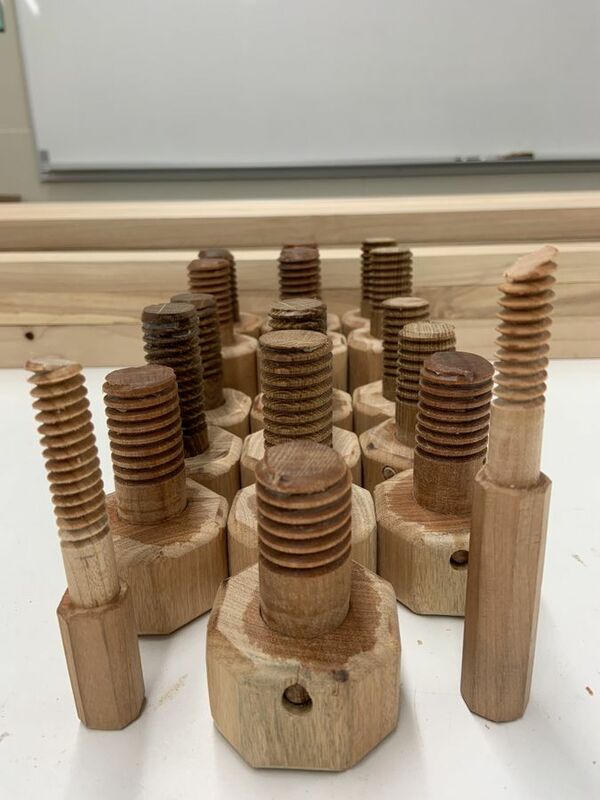 I added some mahogany octagonal handles to the screws and pinned them in place with cross-dowels. 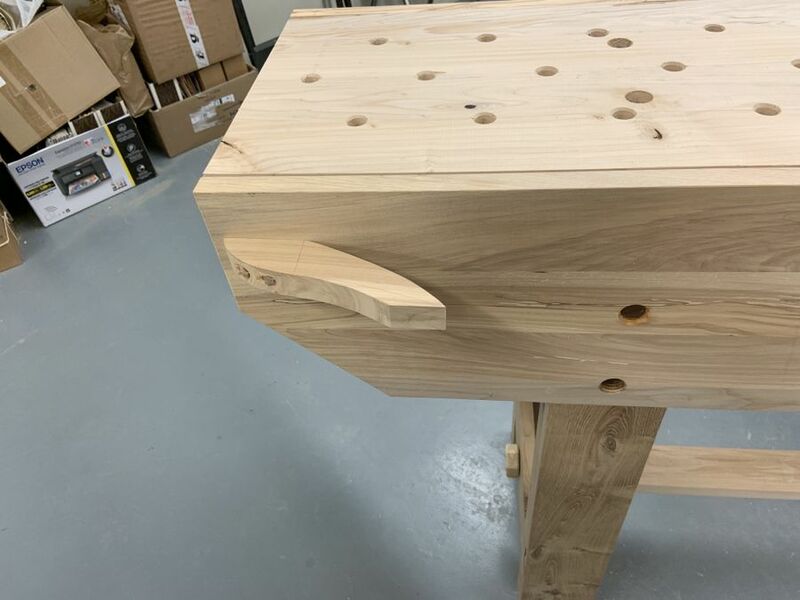 I bore 3/16 pilot holes in all of the places where the screws would come thru to assemble the table, then bore 7/8 holes in the apron and the top for tapping; then used a brace and an adjustable bit to bore out 1" + a hair holes in the leg frames to allow the screws to pass thru easily, but leaving little room for play in the join. The bench is very sturdy and quite heavy. It goes together quite easily, and requires no tools for assembly. Now I just need to add the dog holes on the apron. Here's a shot of how it all goes together. I made some handles longer than the others in case there wasn't full clearance to turn them when they were together. This was definitely necessary for the crochet. The screw on the top. 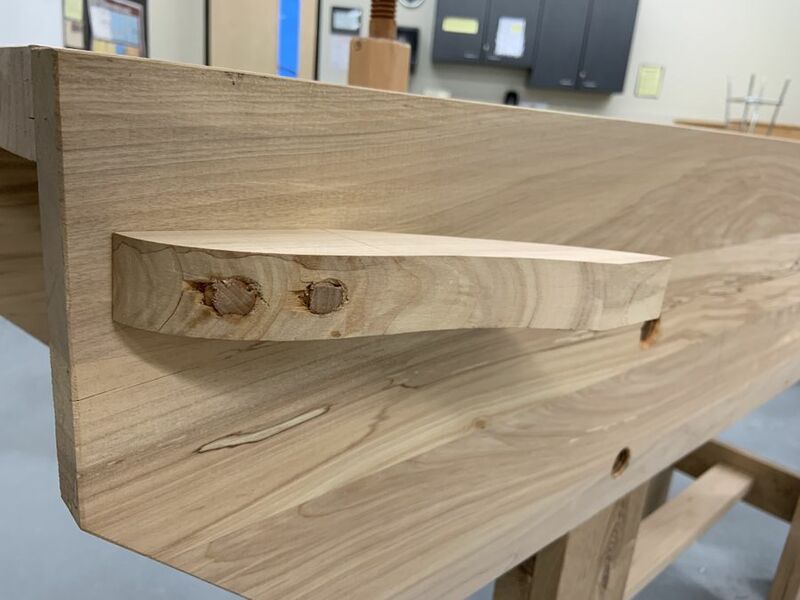 The dovetailing at the top of the rail. All apart and ready for transport.